Highly nostalgic and yet still accessible; Emperor Edition hits a high note as Legend of the Five Rings’ greatest base set to date. Emperor Edition gives new breath and life to the second longest running collectible card game (CCG) on the market, Legend of the Five Rings (L5R). Emperor Edition resets the most common tournament format and brings with it some of the most streamlined and intuitive rules the game has seen in its sixteen years of print. Emperor Edition offers something for everyone, from the casual CCG player to most competitive tournament player. From the foundation of the game’s two-deck format, to the iconic Stronghold card type and the recently introduced Border Keep/Bamboo Harvesters mechanics, there is already more to L5R in the starter decks than many other CCGs. The game’s publisher, AEG, has labeled Emperor Edition with the descriptor of “Premium,” which is very evident in the new starter decks. Much more than a stack of cards, they are the perfect start to your Emperor Edition card collection. The beautifully illustrated box is thick and sturdy, with more than enough space for two complete sleeveless decks, or one deck in your favorite sleeves. Included with every starter deck is your pre-constructed (and fully playable) deck of 80 cards, the Stronghold and starting Holdings for the deck, three additional alternate Stronghold cards, four random Rare cards from Emperor Edition, 36 assorted cardboard tokens to aide game play, a short story centered around the faction of the starter, the gorgeous full-color rule book (complete with a set checklist and another, more generic short story), eleven “Bio” cards that give you a short backstory of all the characters contained within your deck, a couple of redemption cards you can collect and trade for special promos, and on top of all of that, three sealed booster packs to get you started on the collecting aspect of the CCG game model. Two of the boosters are from previous expansions, each containing 11 cards which are legal for the Emperor tournament arc. The Emperor Edition booster itself contains 15 cards (one rare, five uncommons and nine commons) as well as an extra Premium card. In addition to being the key to drafting L5R, it can also be rules on how to draft, a proxy card for created cards, a redemption card, or extra Koku. Looking at the cards that make up the set itself, L5R’s Emperor Edition breaks away from the mold that previous base sets have embraced and introduces several new cards in the Rare slot. Previously a veteran player could expect to fill the majority of their rare sets with cards from their collection, but with the new rares in Emperor Edition, the base set gives a bit of trading power to the newer player by forcing the entire player base to seek out these exciting new cards. Emperor Edition also brings back a lot of cards from across the sixteen year span of L5R. Older players will recognize memorable cards from games past returning to haunt their new games. One of the biggest benefits of these nostalgic inclusions is that the game immediately feels familiar to returning players. Emperor Edition boasts some of the best new art for a CCG in years, and with some of the older cards returning with their original art, it’s a wonderful slice of the game’s artistic journey over its lifetime. Mechanically, the base set has something for everyone to enjoy. Cards for every type of player exist and give you the freedom to create the deck you want, rather than being forced by the game’s mechanics. Each of the nine Clan factions has a selection of four themed strategies players can use to guide their deck construction. While not all of these themes currently can field a competitive deck, there is certainly no reason each theme cannot be realized in a complete and fully constructed deck. The strengths and weaknesses of the themes and the factions feels very balanced for such an early point in a tournament arc. There are weaker decks, but the typical Rock/Paper/Scissors (RPS) competition for top decks with a competitive CCG field feels more like a RPS match with about fifteen other options available to the players. It really is an exciting time to be a competitive player in L5R. Due to the complexity and depth of this game, it probably isn’t ideal for the family, casual and social gamer types. Our definition of a strategy gamer usually excludes games where you draw from decks of cards due to the high amount of luck involved. L5R’s duel deck system, multiple ways to win, and universal resource management (you can play cards from any clan no matter your clan alliance) eliminate much of that luck, making this a game that could be intriguing for a strategy gamer. Avid Gamers will find hours of enjoyment discovering the strengths and weaknesses of the game’s nine clans. The synergy of mechanics and flavor Emperor Edition imparts on the game allows one to get lost within the L5R world, Rokugan, without losing the challenge of the game itself. For the gamer who wants to try to bring every advantage he can to the table, Emperor Edition provides the best competitive environment in CCGs today. With nine core factions each sporting four potential themes, power gamers will have their hands full trying to wring every last ounce of performance from their decks as they try to decipher a vast metagame influenced by tournaments held around the world. Where does the release of Emperor Edition leave Legend of the Five Rings overall? The gameplay is the most accessible it has been in years, the card pool has something for every level of player, and the community is more involved and active now than ever before. Thanks to the attention to the extras in the starter decks, and the unique aspects of L5R and its community in general, there is no other CCG that allows the dive-right-in feeling that Emperor Edition provides. While often times a significant gap in deck strength exists between competitive and casual L5R, it is by no means insurmountable, and shouldn’t impact a newer player’s enjoyment of the game. The L5R community is a very welcoming environment for new players. With the release of Emperor Edition, my expectations for the future of the Legend of the Five Rings CCG are high. Veteran players are reinvesting, former players returning, and new players are being converted everyday. Featuring improved starter decks for all of the 9 Clans of L5R, including everything you need to get started in L5R: essential cards for your Clan, booster packs from already released Emperor legal expansions and much more! 428 different cards, helping you create the deck you want to play for any of the 38 themes in Emperor Edition. Special Bonus 16th card slot features exciting premium additions to booster packs. Amazing art, introducing you to the expanded Empire of Rokugan and bringing its characters to life. The start of a new era - the Age of Conquest – and its impact across the entire Emerald Empire! 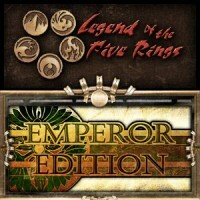 Legend of the Five Rings (L5R): Emperor Edition is the eleventh base set for the L5R collectible card game. It signalled the beginning of the Emperor “arc” of competitive play, with all cards released having a small green “bug” at either the lower left or lower right corner of the text box to indicate legality for that arc (see here for an example). From a design standpoint, Emperor Edition was meant to give multiple options to each of its nine clans immediately upon release of the base set. Starting with previews nearly a year before the release of the set, AEG teased each of nearly forty distinct themes, with four for each Great Clan and a few stragglers for the Unaligned factions. This was an ambitious but flawed undertaking: not all themes received useful cards equally, so there would be a disparity in balance. In addition, designing cards meant to work with a variety of specific keywords had the issue of individual card packs not being largely useful to players who wanted specific themes and decks. That being said, the multi-themed design led to some fun deckbuilding, and people who thought outside the box with their deck choices can be well-rewarded with fun gameplay. Splashing some light dishonor tech into a primarily military deck can be useful in buying crucial turns against a fast-paced honor deck, and so forth. The L5R storyline going into Emperor Edition picks up about 25 years after the end of Celestial Edition. The Empire is rebuilding from the devastation of The Destroyer War; Empress Iweko I still reigns, with her two sons fostered to different Clans to shape their youth; Rokugan is expanding outside its borders for the first time, claiming the tropical ruins of a former kingdom as “the Colonies”. The grand bargain Iweko made with the newly minted Dark Lord of the Shadowlands has formalized the Spider Clan as the Empress’ Conquerors, who after a quarter-century are a part of everyday Rokugani life, whether the other Clans like it or not. The Emperor Edition narrative is one of change and possibility, where the situations faced by the citizens of the Empire are new, exciting, and terrifying. The Emperor Edition product itself is markedly improved over its predecessor, Celestial Edition. Starter decks for a clan include all four base strongholds for that clan’s themes, the Clan Champion, a family House Guard follower, and a divine Guidance card (Celestials, a short-lived card type which provide either an ongoing or strong one-shot effect after entering play), as well as various other cards to support a single themed deck for that clan. There are also a rulebook, a story sheet, several small cardboard token sheets for tracking state changes to cards, and three booster packs to supplement the starter cards. The deck boxes for each clan feature a number of pieces of artwork related to that clan, are made from sturdy telescoping cardboard, and are designed to hold a full 80-card deck (two 40-card decks, Dynasty and Fate) even if the cards have been sleeved. 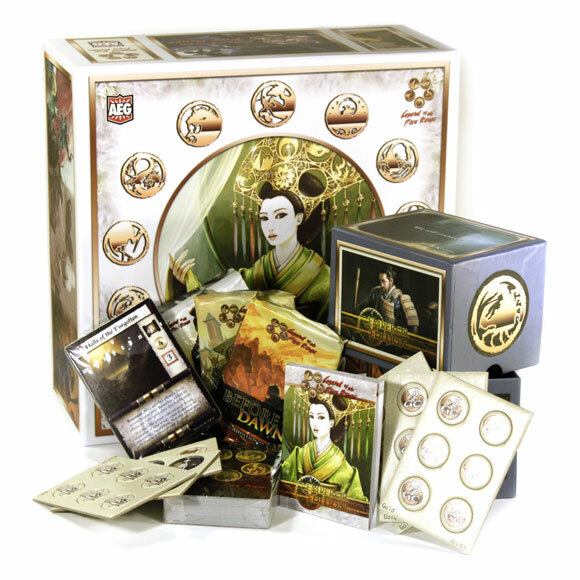 With an attractive presentation and a design which features real utility, the Emperor Edition packaging was some of the best ever created for the game of L5R. Booster boxes were made from larger telescoping cardboard, easily stackable, with a light removable insert separating the packs into two columns. These boxes were designed for easy presentation at the retail level, and useful for storing cards once the boosters were removed. Each Emperor arc expansion included different artwork and clan focus on its identically-sized booster boxes, making for an elegant way to store one’s collection. The boosters themselves in Emperor Edition were geared at Draft, with 10 commons, 4 uncommons, 1 rare, and 1 “premium” card. The premium rarity slot all featured the Draft Stronghold “The Governor’s Estate” on one side, with the other side having Draft Rules, non-deck proxy cards, and (now expired) redeemable cards. This 16-card standard was only used in the base set during the Emperor arc, but would be revisited with the next base set, Ivory Edition, for each expansion of the game so that they could all be drafted equally well. The artwork in Emperor Edition marks a high point of the game’s visual presentation, with gorgeous pieces by L5R veteran artists such as April Lee and Drew Baker as well as newer talents. The cards in Emperor Edition have a relatively high level of power compared to prior arcs (excepting Lotus Edition), and a drastically higher power level than subsequent arcs. The Emperor arc is characterized by a power level that started high, remained high, then spiked to untenably unbalanced levels by the end (five or six expansions in). For players looking for a dramatic game, the power level will be satisfying, though take care that decks built by each opponent are not wildly out of balance with each other, or one player may not have as good of a time playing. The actual release of Emperor Edition was a high point for the game in terms of player excitement and involvement with the game. It is unfortunate that the competitive Emperor arc did not seize the potential of that excitement, but it should not diminish from the overall quality of this particular product achievement. This current core set is a step above my expectations. The price for the starter decks has nearly doubled. This would be a HUGE downer, and a possible deal-breaker for me EXCEPT they didn’t just raise the price, they upped the presentation and quality of their product through and through, and raised the price accordingly. I am more than happy to compensate a game company for the work they did, and AEG did plenty. The art has been a gripping feature of this game since I saw my first card, but the art this arc has really impressed me. If you’re a fan of fantasy feudal Japanese artwork, check L5R out! The packaging is 150% better than Celestial packaging. There is room in your starter box for a whole sleeved deck (fate and dynasty, SH, and counters) and it’s made of thick cardboard, so it stands up really well. It is a slide-top box (like a board game) versus a flip-top box (like a deck of cards). This means there are no flaps to wear out. There are three booster packs in each starter, one Emperor Edition (EE), one Second City (SC), and one Defore the Dawn (BtD), as well as some pre-cut counters, a rule book, and 90 cards (fate and dynasty plus some uncommons and rares). All in all I gave this game a ten because it truly is the most rewarding card game I’ve ever played. It is a bit steep on the learning curve, though. It’s not bad, but be prepared to devote a bit of time to the mechanics and interactions of cards. It’s a huge benefit to have someone who knows the game to teach you. I’ve played through almost every core set in the game’s history and this is by far the best. Add a Review for "Legend of the Five Rings – Emperor Edition"